Most observers rightly argue that not only have the go-go years ended, but that Russia’s economy also faces major threats going forward. One scenario, based on low oil prices combined with greatly increased state spending, envisions the development of a twin deficit on the federal budget and current account as its huge trade surpluses disappear, forcing the country into some combination of devaluation, increased borrowing and/or a great reduction or even disappearance of its massive currency reserves. These risks have led some analysts to the non sequitur that since Russia needs reform to avoid these problems, there will indeed be reform. This is a strange enough conclusion to make with regard to developed countries – the UK, United States, Italy, France and Japan spring to mind – but it is bizarre in the Russian context, where reform has consistently been derailed since the time of Peter the Great because the rulers consistently pull back from seeing things through for fear of losing control. Three factors speak against full-blown reform in Russia instead of the usual muddle-through variety: Russia’s history, Putin’s personality and economic and political views and Russia’s current political and economic structure. Dmitry Medvedev’s modernization attempts, the Skolkovo project, and current official propaganda are all eerily reminiscent of the 1970s and 1980s. The first oil shock in 1973 ushered in a period of high energy prices and gave the Soviet Union its best-ever chance of real reform. During the perestroika era, the talk was of switching from extensive growth based on increasing labor inputs to intensive growth based on more science and technology. But when oil prices slumped in the mid-1980s, they seriously undermined the efforts of Mikhail Gorbachev to move in that direction. And just as the country spectacularly squandered its chances for reform in the 1970s and 1980s, Putin made exactly the same mistake between 1999 and 2008 – despite increasing warnings from the Russian and international policy communities as the 2000s progressed. He simply ignored them, just as the Soviet Union’s leaders ignored them in the 1970s and 1980s until it was too late. Most Russian and international economists agree that after a bout of positive changes during Putin’s first term, the impetus for reform and economic diversification has long since hit the skids and the country has became more dependent than ever on commodity exports. But during the election campaign, Putin and others argued that the current economic model had now exhausted its usefulness, so policy changes would indeed follow. This is flat wrong - the model was flawed from the start, and the high earnings from energy should have been used to institute far-reaching change while the going was good, for instance, to develop small and medium-sized businesses. But this was not done, and policy slippage combined with a failure to understand the global economy, led Russia to experience the biggest drop in GDP of all the G20 countries in 2009 as the Great Recession hit the global economy. The Putin 1.0 era was characterized by increasing hubris on Russia’s part and the frequent subordination of pragmatic economic aims to more authoritarian traits as Putin and his security-minded colleagues – the siloviki – attempted not only to reassert Russia’s position internationally, but also to re-establish order and reassert Kremlin control over the economy after the perceived chaos of the 1990s. But this entailed a huge increase in red tape and the numbers of bureaucrats – and in the Russian context, that was bound to lead to massive corruption. So the small and medium-sized sector was smothered in the cradle. Putin periodically engages in populist anti-business rhetoric, but at the same time he is keen to retain his freedom of action to solve problems and follow policies as he sees fit. The upshot is that Russia has failed to convince Russian and domestic investors that it is ruled by the law and not by men. Even Russian investors believe that rules and regulations can be changed at the drop of a hat, so they don’t invest to anywhere near the extent the country needs and prefer to park their money offshore, despite the flat-rate income tax of just 13 percent. Much-needed supply-side reforms such as reduced red tape are one obvious answer, but that runs the risk of greater freedom and independence for businessmen and citizens - and a subsequent loss of Kremlin control. Back to square one! Putin has thus boxed himself into a corner and now argues that growth of 4-5 percent is still good in the more difficult circumstances. At first glance, this looks right. Mature, developed countries at the top of the S-curve inevitably grow slowly, while poor countries like China and India at the bottom are experiencing much faster growth from a low base. Russia is somewhere in-between. But there is virtually no question that the right reforms would result in huge prizes both for Russian and international investors. Gazprom is an excellent example. Slava Rabinovich, CEO and founder of Diamond Age Capital Advisors Ltd., recently pointed out in the Russian edition of Forbes, that international portfolio investors stampeded for the exit following Russia’s 1998 ruble devaluation and sovereign default – but since then, Gazprom’s shares have increased fiftyfold! . And yet, many analysts argue that Gazprom is not run on commercial lines, since it is an arm of Russian foreign policy. But with around one quarter of the world’s conventional (non-shale) gas reserves, Gazprom should be worth far more than Exxon, or indeed Apple. So the question arises – why should it be different this time round? Can Putin 2.0 really convince Russian and international investors that the country is serious about reform and that they can safely put their money into the country? A big problem is that for every statement of serious intent to improve things, there is another one in the opposite direction. When asked about Russia’s huge levels of corruption on the BBC World Service program Hardtalk last week, Putin’s press secretary Dmitry Peskov gave one of Russia’s two stock answers to foreign criticism: the criteria Transparency International used to reach its assessment were incorrect. The other stock answer is that corruption happens everywhere – as if it had reached anywhere near Russia’s massive systemic level in any developed country. This approach not only does nothing to advance Russia’s cause, but also shows international politicians and investors that Russia simply doesn’t get it: it can’t make the right changes because it doesn’t understand international politics and business. In fact, Putin’s biggest mistake since becoming prime minister in 1999 is one that analysts and investors virtually never mention explicitly. They talk about improving the investment climate, establishing an independent judiciary and developing a responsive political system. But this is all part of the broader trust needed between rulers and ruled. A major reason for the unprecedented wealth and living standards in developed countries is that they are invariably high-trust societies. Despite all the current problems and dissatisfaction, trust there is still incomparably higher than in Russia, where, after Putin’s 12 years in power, distrust between the state and the people in Russia remains as great as ever. Business still sees the state as arbitrary and unpredictable. 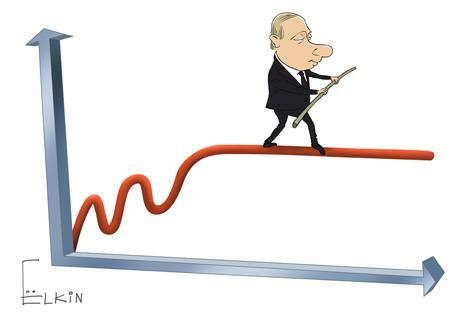 Russia’s economy hardly faces collapse. Indeed, the government’s privatization plans sound promising, while domestic businesses should become more competitive after they are exposed to greater competition following Russia’s accession to the World Trade Organization in August. But without fundamental changes, it is hard to see how the country can move up several gears from muddling through as “The Land of Limited Possibilities” to fulfilling its huge potential. Given Putin’s personality and peculiar worldview , this is hard to imagine. But if Putin doesn’t make such changes, he is likely to see Russia being increasingly sidelined by China, which according to Western observers will be bringing path-breaking – and commercially successful – cutting-edge products in mobile telephony and bio-tech onto the global market in the next few years.